In spite of the name, which suggests the Spanish cuisine, this is a Sardinian dish, from Alghero! There are many versions of this that I have prepared, for a change, it is a further variation! Moreover, as for many other preparations, the literature in this regard is very diverse and also the ways in which I was asked many. First, boil water with vegetables and spices; when bubbles cook the octopus, with water that continues to simmer and the pot covered, for about 30 '. Allow to cool octopus in the cooking liquid. Sliced ​​thin, ring, red onion; to quench a little 'the very strong flavor it can sprinkle with coarse salt (a little) and just begins to soften very well rinse it under running water. If you love the full flavor of the onion, however, simply let it stand in cold water. Cook the potatoes, peel and slice them just lukewarm. Prepare in a bowl with an oil-based dressing EVO, parsley, salt and pepper. Slice the tomatoes, place them on a tray along with the potatoes, if you want, and basil chopped hands. 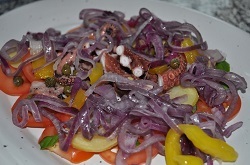 Cover with octopus cut into logs and then add at will the pepper cut into small cubes and pitted and chopped olives. Sprinkle with the onion rings and pour over the sauce. Hold back a half hour, to allow merge the various aromas, before starting to eat it or take it on the table! It is not the scene but is just as good! olives, peppers, potatoes, depending on who prepares it, may or may not be there. Those that are never lacking octopus, onions and tomatoes! I sometimes love to put a little 'of capers. burnet. Often I substitute parsley with burnet, or enrich it with this herb. There's a reason: in summer and winter, in my garden, burnet grows lush while parsley much less! wanting to serve as an appetizer, along with other things, you just prepare the plates, possibly decorated with a leaf of lettuce on the bottom, for the table.